I'm very excited to be taking Daniel McCarthy's class Native American Plant Uses through the Desert Institute. Discover the abundant uses of native desert plants with Daniel McCarthy. McCarthy will teach participants about the plants historically harvested by the native peoples of Southern California for food, medicine, and utilitarian purposes. The program will start with an overview of local Native American tribes and how culture defines plant use. Attendees will learn about plant communities, habitat, and distribution, focusing on the ethnobotany of key species found in the Mojave and Colorado Deserts. In the afternoon, the class will identify edible plants found in Big Morongo Canyon Preserve. No plants will be harvested. Respectful gathering practices will be discussed as well as restrictions collecting on federal lands and in the National Park. 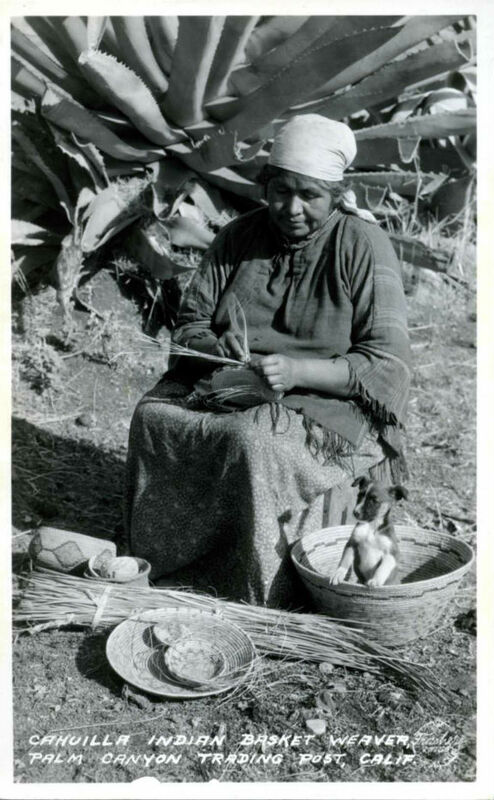 "Cahuilla Indian basket weaver, Palm Canyon Trading Post, Calif."
Note the agave in the background which was a staple food. To prep for the class I'm reading Mukat's People free online. The book tells about the native Cahuilla Indians in the area. If you scroll to the table of contents you can click down to page 36 and begin the chapter titled Plant Environment. This tells of the staples of the Cahuilla, how and when they were processed, by whom and the traditions and ceremonies around the collections of various foods. These included acorns, mesquite, pine, cactus, agave, yucca and nolina, seed pods (cat's claw accacia, palo verde, desert willow and ironwood), fan palm, and more. If you're into edible or medicinal plants consider taking this class. More people knowing about the utility of desert plants could go a long way towards protecting habitat in the Morongo Basin.